The ingredient in goji juice varied and rich in essential elements which more energetic life and healthy life. Some of the contents are polysaccharides in the form of LBP 1, LBP 2, LBP 3 and LBP 4 19 amino acids 21 trace minerals essential vitamins. With the growing realization of the benefits of Goji on the health and mind, there has been a surge in its demand for the treasured natural product of the Himalayan region. The product has thus found its way to the world's major laboratories and the pharmaceutical companies with its unique set of ingredients. The goji plant is hardy and survives in any kind of soil and climatic condition, yet sometimes the change in the soil and climate may caste a serious impact on the ingredient or proportions in goji juice and hence may change the natural nutritional value of the goji fruits. The goji fruits from the Himalayan range are rich in nutritional values and thus enhance health by fostering better anabolic and metabolic system, strengthening the immune system, glowing skin and better endurance. The main and the salient ingredient in goji juice includes the combination of polysaccharides in the form of LBP 1, LBP 2, LBP 3 and LBP 4, which the main focus of Dr. Earl Mindell's research work was laid on. 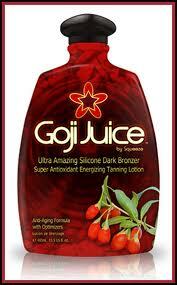 Other very significant ingredients in goji juice are 19 amino acids, vital for good health. Besides there are also 21 trace minerals including even the rarest form of element like Germanium. Apart from these the goji fruits also contain various essential vitamins as well. Researches have found that the goji juice is the richest source of all the natural carotenoids - a generic term for a class of carotenes along with their oxygenated derivatives. A vital ingredient naturally present in the goji juice is Vitamin A. the fruit is also the source of other vitamins such as Vitamin C, Vitamin E and Vitamin B complex, which include thiamin, niacin (nicotinic acid), niacinamide (nicotinamide), riboflavin, biotin, folic acid, pantothenic acid, Vitamin B12 and Vitamin B6 (pyridoxamine, pyridoxine and pyridoxal). It also has the required quantity of Sitosterol, Cyperone, Solavetivone, Physalin, Betaine and the essential fatty acids. Thus a Goji Juice ensures a healthy, energetic and radiant life.